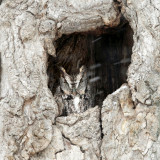 Very nice serie of this Screech Owl ! Fascinating bird and gallery. Do these guys make a habit of sitting exposed at the entrance to their hollows?